Met deze 8-Pack licenties kunt u 8 (acht) extra camera's toevoegen aan uw Synology NAS. U ontvangt de (enkele) licentiecode automatisch, direct en kosteloos per e-mail. Het invoeren van de licentie is eenmalig. Het verzenden van de Synology Camera Licentie is bij ons geautomatiseerd. U ontvangt na betaling direct uw licentie per e-mail. Dit kan 24 uur per dag, 7 dagen per week. Synology Camera License Packs zijn ontworpen voor het uitbreiden van camera's op uw Synology NAS. Gebruik het Synology Surveillance Station om alles te beheren en in te stellen. Camera's van meer dan 75 fabrikanten (2700+ camera's) zijn geïntegreerd en ondersteund in de Synology DiskStation. ONVIF, ACTi, Airlive, Arecont, AVIPC, AXIS, Cisco, Compro, D-Link, Edimax, Foscam, Hikvision, iPUX, IQinVision, JVC, Levelone, Linksys, Messoa, MOBOTIX, Panasonic, Pixord, Sanyo, Siemens, Sony, Toshiba, TP-Link, Trendnet, Vivotek en Y-cam. Voor een compleet overzicht, bekijk de Synology Compatibiliteitslijst. You can add eight extra cameras with this license to your Synology NAS product. Directly after we've received your payment we sent you one license code (that serves for 8 cameras) via Email, without any shipping costs. We are proud to announce that we've automated our delivery for licenses. 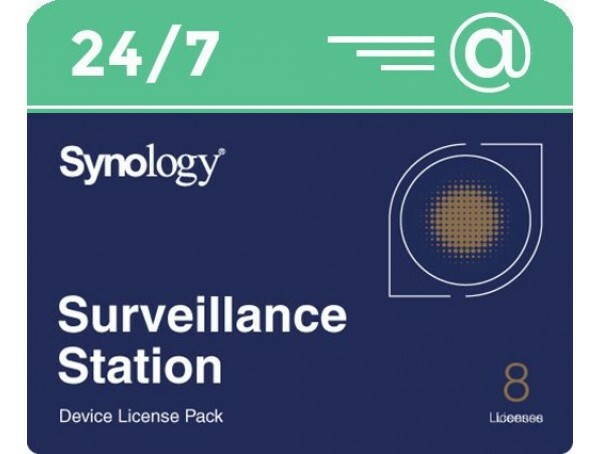 After your purchase, you will receive your Synology license directly 24/7. 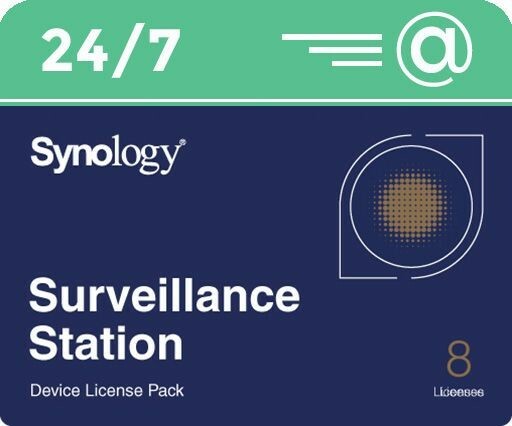 Synology Surveillance Station works with your preferred mobile device, webbrowser and operating system. With the free DS cam app you'll be able to monitor your property from anywhere. With DS cam, you can see up to 6 camera's simultaneously, take snapshots, and adjust your camera's position with PTZ actions. Synology Surveillance Station supports a Central Management System (CMS). This is designed for multi-server surveillance deployments. The CMS infrastructure consists of a "CMS host server" which has total control over other Synology recording servers across different locations. This will allow you to effectively monitor and manage large surveillance systems. CMS offers centralized control from a single login, allowing administrators to reduce the time spent maintaining Synology recording servers and IP cameras. The Synology Device Licenses will work on every Synology NAS worldwide. The license has no recurring fee, and can be transferred between devices when upgrading. Please check your NAS specifications or the comparison page for the Maximum number of IP cam's.